Heat Pumps allow industry to take up waste heat and apply it to processes needing heat. 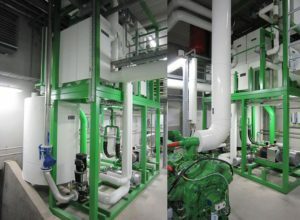 As a result of research and development heat pump temperature limits have increased dramatically allowing heat pumps to heat many industrial processes. This affords industry the opportunity to make significant strides in cutting the costs of both heating and cooling through the reuse of waste heat normally sent to drain or dumped to cooling towers. Waste heat has value. You paid money to make it. Instead of dumping it why not collect it and reuse it. The Hybrid Heat Pump is designed to give good COP’s, apply heat up to 115°C. Hybrid Heat Pumps heat and cool. This affects the cost of manufacturing in a number of ways. Use of a Hybrid Heat Pump can eliminate boiler use, reduce fan use for cooling towers, reduce tap water use and sewage costs.